I'm a little late but this post is for Mother's day. So how do you create an image with a complex, perspective ridden backgrounds and children? Why with good reference of course. 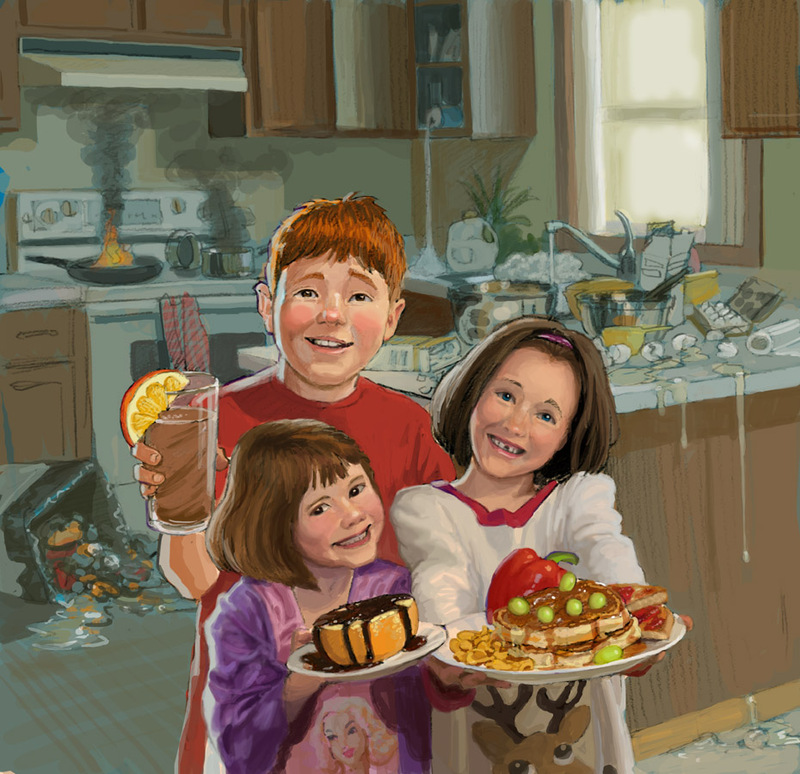 For this project I contacted some family friends and asked to borrow their kids... and their kitchen... and make a mess. I came up with the idea, did some sketches and went through the cupboard to find the crazy breakfast items. With a couple of bags of food and dishes I headed over to the "set." The kids were ready for me in their pajamas but had no idea what to expect. They watched as I put dishes around the counters and then created my breakfast concoction. 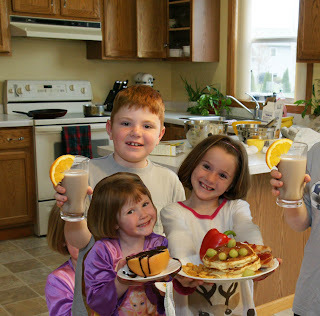 There were many questions about why I was putting chocolate syrup on the grapefruit and Fritos with the pancakes. I then put them in poses and took about 25 pictures. I will admit that I did not stage it very well or mix up my compositions. One problem I ran into was that the oldest son was quite a bit taller than the girls. It was also challenging to get the right expressions on all three at once. But that is why you take many shots. Upon reviewing the images I found 3 individual poses but none were together. So I just clipped out the ones I liked best and posed them, adjusting height and position. You can see I wasn't too interested in making this very clean - just wanted to get everyone in position. Next came the painting. Due to time I went with a digital medium - just my tablet, Photoshop and me. The final version turned out like this.